While some have predicted the end of email marketing for years, email continues to go strong and prove its outstanding ROI value. When email is integrated with the latest social media marketing methods, this duo of digital power can reach consumers at every stage of the purchasing process and initiate an ongoing cycle of success. eMarketer.com recently interviewed Ed Kats, president of MediaWhiz digital marketing agency, about why email marketing is an essential component to all successful digital marketing campaigns. “Email is absolutely an integral part of our online marketing tool chest. It’s by far one of the most profitable, ROI-focused media channels that we use,” said Mr. Kats. He added that well-targeted email marketing campaigns drive the development of other initiatives and determine the subsequent media channels used to continue contact and conversion. Mr. Kats emphasized the importance of targeting in email marketing since proper targeting provides the data required to tailor the message to the recipient. Today, personalized email marketing has taken on greater importance to consumers who appreciate being recognized by companies rather than just being another name on an email list. Tailoring these email communications requires knowledge of the recipient’s behavioral patterns and preferences. Fortunately, consumer data provides a treasure trove of facts and figures about the consumer that can be used to craft these personalized messages and ultimately facilitate the goal of a one-to-one marketing experience. Some have started to question whether email is a useful way to reach the younger generation that prefers texting. Mr. Kats agrees that this is a noticeable trend, but explained that the proven ROI of email marketing ensures that it will remain a key digital marketing tool for brands. In terms of the integration of email with social media, Mr. Kats believes they work hand-in-hand. After all, social media is the place where consumers interact, and email is the place where consumers make purchases. By reaching out to the abundance of consumers in a social media environment, brands can make initial contact and start to build relationships with consumers. Then, those relationships can then be reinforced on a more personal level via email, with the email marketing driving consumer sales. Finally, satisfied customers will want to continue their contact and conversation with the brand in a social media setting. 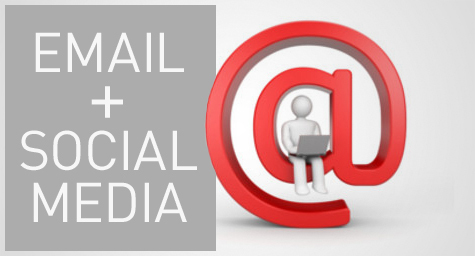 Basically, social media affects preference, but email marketing affects purchase. Together, they provide brands with the reach, response, and revenue they need to create the long-term customer loyalty that delivers steady and strong sales performance. To integrate email marketing and social media into your digital marketing strategy, contact MDG Advertising today at 561-338-7797 or visit mdgadvertising.com. MDG Advertising, a full-service Florida marketing agency with offices in Boca Raton and New York, NY, specializes in developing targeted Internet marketing solutions, exceptional creative executions and solid branding and media buying strategies that give clients a competitive advantage. Our core capabilities include branding, logo design, creative, digital marketing, print advertising, direct mail marketing, media planning and buying, TV and radio, Web design and development, email marketing, social media marketing, and SEO.